Statistically, animals images are one of the most popular motifs for tattoos nowadays among people of all ages, genders and lifestyles. What is the reason of its popularity? From the very beginning of its existence, humanity has been strongly connected to Nature and its creatures. Roughly speaking, we ourselves are a part of animal world and our lives, as well as lives' of our four-legged friends, are largely influenced by inner instincts. So, it comes as no surprise such connection affected the art of tattoo. From time immemorial, our ancestors used to decorate their bodies with images of animals that often were deeply symbolical and metaphysical. The significance of such tattoos can be overwhelmingly diverse. For many people covering their skin with an animal tattoo is the way of telling the world about his or her worldview and passions. For instance, they choose the character of this or that representative of fauna they associate themselves with (by temper, habits or appearance). Sometimes this similarity appears to be unobvious, the choice often represents the features people are willing to have. It can be seen as a spiritual growth, expressed through a tattoo. Besides, a skillful master may turn the image into a true aesthetical masterpiece. This type of tattoos has permanent and increasing relevance, so should not worry it will lose its popularity. 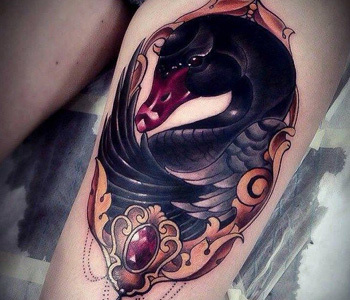 Thus, if you started dreaming about the depiction of animal you would like to see on your body, think carefully there reason and symbolism of the tattoo. And we are glad to help you finding out, which critter would perfectly suit you fine. Some ethnographic and anthropological researches proves animal tattoos are wide-spread all over the world. Some scientists claim this tradition evolved from the ancient totemic beliefs. Totemism manifests mystical relationship with a spirit-being, such as an animal or plant thought to be a forefather of a human or a social group; it consists of both religious and social sides, which are equally important and interconnected. It is believed totem item give double favor to its owner. First of all, they point out the spiritual connection with an animal and, above all, they help uniting separate individuals. 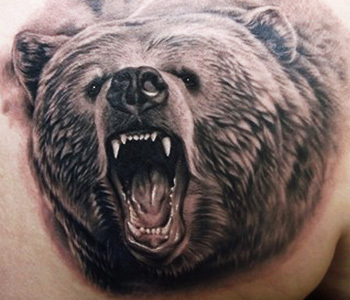 One of the biggest groups of animal tattoos are images of predators, like wolves, bears, lions, etc. Each of them has a huge palette of cultural meanings, but the thing that unites all this character is… aggression, of course. Aggression and power. Aggression doesn't necessarily means ugliness – even when its utmost state can be show with striking grace and beauty. When choosing such tattoos, you should remember then express your feelings, and feeling often change. So the image should really resonate your personality. Moreover, the way an animal is depicted also affects its symbolism. For instance, a wolf howling on the moon signifies solitude and independency. A jumping wolf can tell about determinacy and readiness to overcome barriers. A running wolf is associated with love of speed, risk and changes. A wolf shown with his pack symbolizes a leader. This animal can become a mystical one, like werewolves that are usually tattooed with bared teach and red eyes. The same case is with bear – it image can be kind and wise or angry and fierce. 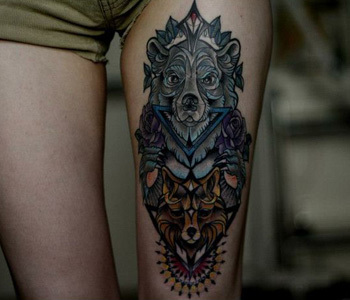 But in general bear tattoo symbolizes resurrection and the beginning of new life (because of the bear's hibernation patterns), courage, bravery and even motherhood, nurturing and protection, since we endow those features to bear mothers, known for their devotion to their offsprings. It's hard to think of more contradictive and impressive animal as shark. Its reputation turns shark tattoos into the manifestations of rage, fearlessness, self-confidence and graciousness. But these are just the most general traits of this character, since it was seen in different ways in various cultures – from Australian aborigines to European sailors. One thing is for sure – shark tattoo suits persistent and nonconformist individuals. What is more, shark became a symbol of business and games of chance, revealing mightiness, dominance and superiority in what you do. It is more than logical that birds tattoos are associated with the air element. Our ancestors believed them to be the mediators between earth and sky, people and gods. That's why the souls of passed-away humans were often depicted as flying birds. But anyway, the semantics of bird tattoo depends on the type of bird you choose for the drawing, since each of them has its own significance. Swan tattoo evokes thoughts about faithfulness, love and eternal gentleness, while eagle tattoo stands for pride, prescience and independence. Some of birds have controversial meanings, like a raven tattoo: one hand, it is a symbol of wisdom and longevity, but on the other, in art it is often connected with dark forces, bad news and fails. However, in most of the cases, birds are a favorable sign: in Christianity, for instance, white dove represents the Holy Spirit. Water element is expressed through all kinds fish tattoos. Fish have a well-developed symbolical connotations, shaped up for thousands of years. In Buddhism, fish is associated with spiritual enlightenment and rejection of material affections and passions. Chinese, as well as ancient Greeks and Romans, believed it to be a sign of wealth and harmony, while Hinduists considered it as a symbol of family and marriage. Don't forget about Pisces zodiac sign as well – it can become a nice tattoo motif for those born February between 19 and March 20. Apart from being visually attractive, fish tattoos have a noteworthy symbolical context. Fish is often connected with fertility and motherhood. Its natural qualities make it a visual metaphor for dynamism, desire of development, grace and femininity. 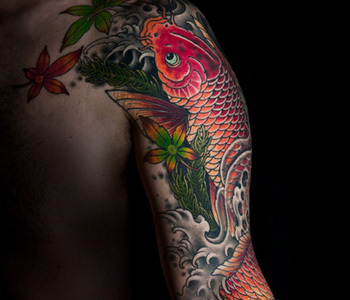 Whenever want to get a mysterious and profound image – fish is the right choice for tattooing. Let's start with the butterfly tattoos that are the most wide-spread images among young women, because of their elegance, bright coloring and resemblance to the 'flying flowers.' It is curious, but there's no single negative meaning of a butterfly throughout all cultures and epochs: in Ancient Greece it stood for immortality and pure soul (because of the amazing transformations from a caterpillar into such a beautiful creature); in China it was a sing of those in love, joy and summer; in Japan butterfly symbolizes good news, love, female beauty and family wealth. 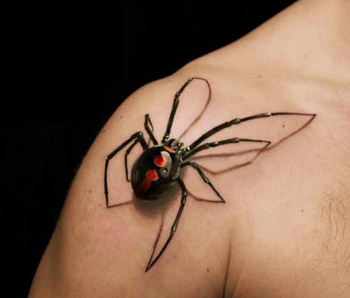 For men spider tattoos would be more appropriate. There are several interpretations of this image. In myths spider is often attributed (particularly by Ancient Romans) with such qualities as wisdom, diligence and good omen. At the same time, it is seen as an embodiment of greed, wickedness and evil. Spider is a master of destiny, who creates the web of his life himself. It is a symbol of Absolute as his eight legs signify eight parts of the world. 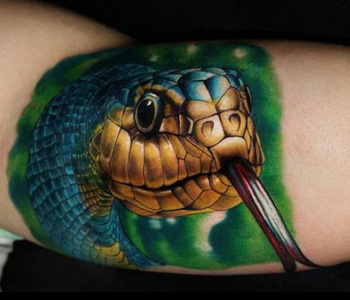 The third popular type of reptiles and insects tattoos is snake tattoos. Snake is an archaic character that is associated with secret knowledge and quick wit. It's often rendered as a female sign, as in Greek mythology snake was connected with the goddess of Moon, and lunar symbolic is always feminine. In Christian world snake has serious biblical connotations, rooted in the story of the original sin and temptation.